Probably the most photographed building on the Island due to its stunning sea location. We specialise in luxury bed only ... town and award winning restaurants are within easy walking distance. 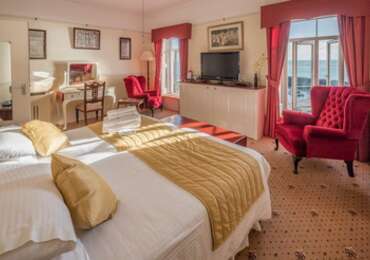 Each room is tastefully decorated, most have excellent sea views and their own arm chair / settee sitting area, making it ideally suited for couples who prefer a comfortable long stay in a relaxed atmosphere not dictated by conventional tight hotel schedules. 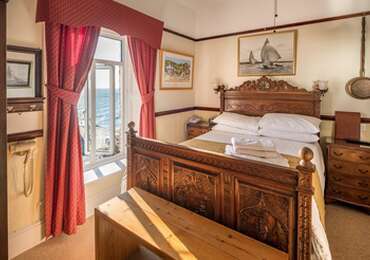 Although rooms have all the conveniences of modern living like being fully en-suite, having coffee and tea making facilities and free wi-fi they are decorated in a tasteful manner befitting of this Victorian period building of historical importance. Queen Victoria adored the Isle of Wight and the view looking down upon the Italianate architecture of St Augustine Villa and its coastline fondly reminded Prince Albert of his previous holidays in the Mediterranean and prompted them to instruct the royal architect to build Osborne House in the same style. Excellent coastal walks in both directions. *STOP PRESS - FOR 2019 SEASON WE WILL NOT BE COOKING BREAKFASTS (cafes and restaurants are within easy walking distance) ROOM 1 is situated on 1st floor (16 steps, no lift) .. has antique comfortable bed (6'X 4'6" width) ...has footboard/headboard hence most suitable for medium/slim build couple...(less than 6' ht.) Room has coffee and tea making facilities and free WI-FI. STOP PRESS - FOR 2019 SEASON WE WILL NOT BE COOKING BREAKFASTS (cafes and restaurants are within easy walking distance). 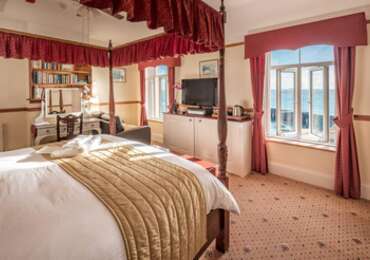 Coffee/tea making facilities and free WI-FI ' ROOM 7 is situated on 2nd floor (32 steps up to 2nd floor NO lifts) Excellent seaviews.has 6 feet width Super-King size 4 Poster Bed and double shower unit.